Tyne Bank Brewery: Hop & Berry Tap Takeover. Hop & Berry Tap Takeover. We are really excited to announce that we are hosting a Tap Takeover in the big smoke in just over a week's time. 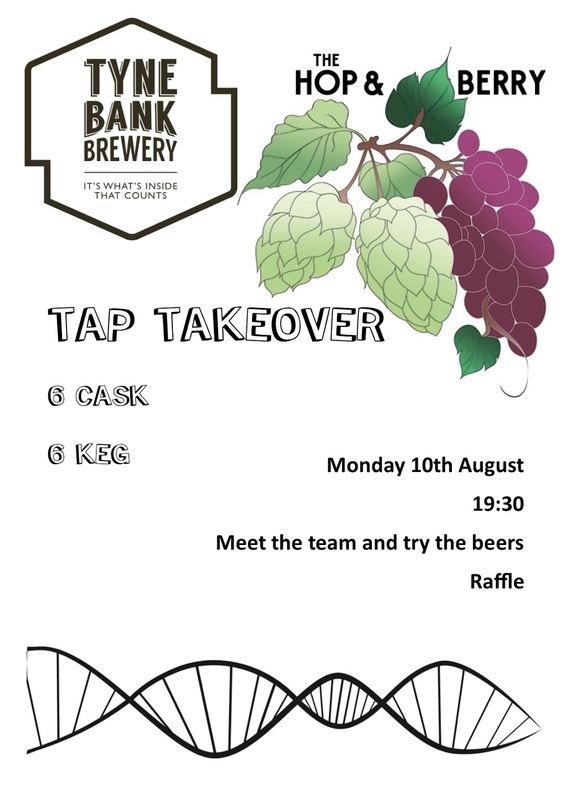 The handpulls and keg lines of The Hop & Berry in Islington will play host by a wide selection of Tyne Bank treats on Monday 10th August. Located just minutes walk from Angel tube station on Liverpool Road in Islington, The Hop & Berry is a pub quickly becoming a haven for craft beer. We are really looking forward to an evening of showcasing our ales in one of the best cities in the world for beer, taking over all 6 handpulls and 6 keg lines showcasing specials, seasonals and core beers from pale and hoppy to dark and malty. From 7:30pm we will be at the pub supporting the event, we'll have samples available of some of our ales in both cask and keg, and we'll be on hand to chat about the brewery and the beers. With every pint you buy you'll be entered into a raffle to win Tyne Bank prizes but be warned, if you're not there when we draw the numbers, we'll keep drawing until someone else wins! So if you're in London for GBBF, make sure pop along and join us for an ale or two.